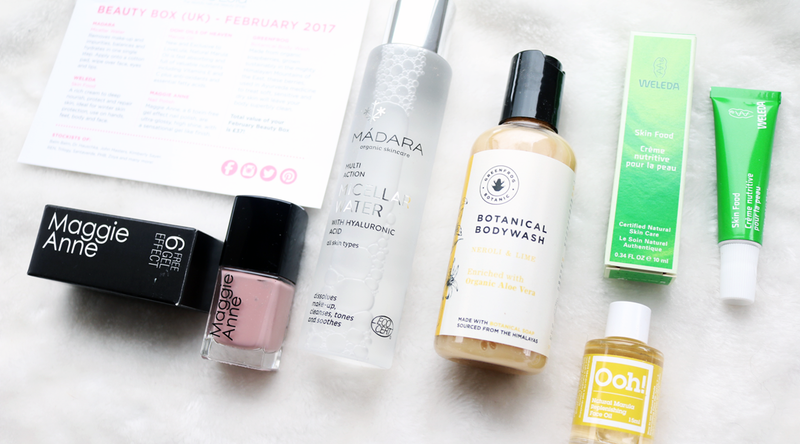 LoveLula's monthly beauty box is one of my favourites on the subscription box market and it's always such a treat to come home to. February's box is one of their best yet! One of the many reasons why I love receiving this box every month is because they do a great job of introducing me to brands that I may not have heard of before, so it's a really good way to discover new companies and products that are all green/natural/cruelty-free, and a lot of the time they're organic too. Madara Micellar Water (full size, RRP £14) - I've tried a couple of sachets samples of this from various other beauty boxes in the past and it works pretty well to remove most of my make-up, but it's not very effective for removing mascara or stubborn/waterproof eye makeup. It does feel nice and gentle on the skin though, so if you wear mostly mineral based makeup, I'm sure you'll love it a lot more. I mainly prefer to use it as a refreshing/hydrating toner instead. Weleda Skin Food (10ml travel size) - If you've been reading my blog for a while now, you'll no doubt know that I absolutely love Skin Food and always have at least one tube of it on the go, as well as backups in my stash! It's an amazing multi-purpose moisturiser that's crazy thick but great for giving the skin some serious hydration. I always recommend it to eczema sufferers as well who are looking for a natural based, non-steroid cream. Ooh! Oils Of Heaven Natural Marula Replenishing Face Oil (15ml travel size, RRP £9.50) - There's a lot of hype around the many benefits of Marula Oil at the moment, so I'm curious to try this out to see what all the fuss is about! It's high in anti-oxidants, essential fatty acids and Vitamins E & C, and this one is cold-pressed and ethically sourced. Maggie Anne Nail Polish in Jasper (full size, RRP £10.50) - A vegan-friendly, 6 toxins-free gel effect nail polish in a gorgeous neutral shade. It looks a lot less pink in real life and is more of a beigey-taupe with purple/grey undertones. Very pretty! Greenfrog Botanical Body Wash (100ml travel size, RRP £3.90) - This is a really good larger travel size for longer holidays or multiple weekends away, and it smells beautiful. It's the scent Neroli & Lime so it's wonderfully refreshing and uplifting. SLS-free and made from organic Soapberries grown sustainably in the Himalayas, it's a good one to try if you have dry or sensitive skin. 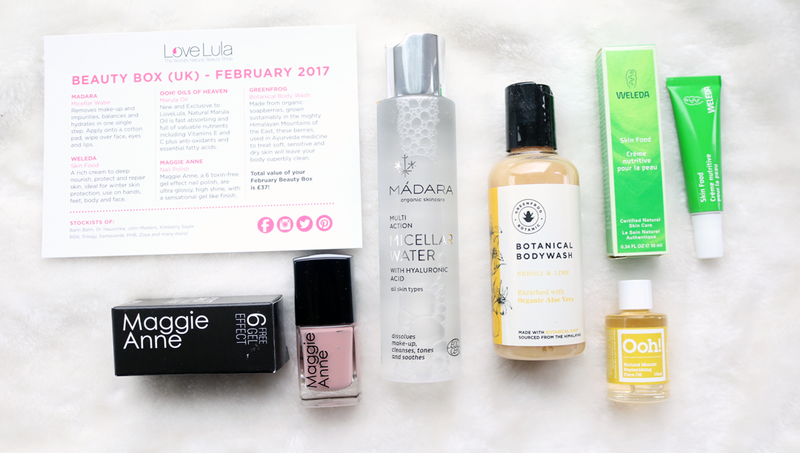 The contents of February's LoveLula beauty box are valued at £37 so it's fantastic value-for-money way to try out a bunch of new green beauty products from a range of interesting eco-friendly brands. LoveLula Beauty Box* is a monthly subscription box priced at £12.50 with free postage in the UK. Visit lovelula.com to find out more. I thought it was a great box this month!